Google TV continues to evolve, and Asus is attempting to keep pace by debuting what it claims is the first standalone box with Google TV 3.0, the Asus Google TV Qube. The Google TV Qube plugs into your television and provides a slightly confusing but fully featured interface for browsing the web with Chrome, checking the news, and watching live TV and streaming content from a variety of sources. The Qube even plays Android games, with full access to the Google Play store, and the multi-functional remote features a gyroscope in addition to a clicky touchpad and a full keyboard. It seems to have everything, and TechRadar was on hand at Asus's CES suite to sit down on the couch and take it out for a spin. The small box itself comes equipped with two USB 2.0 ports, HDMI in and out (in from a cable box, out to the TV), audio out, and an IR blaster. It's not the prettiest little thing - it looks like a cheesy sci-fi prop - but luckily it's small enough to be unobtrusive once it's set up. We recommend sticking it behind your TV and out of sight. Asus says it's the first standalone Google TV box, or "buddy box," as Google apparently calls such devices, to run Google TV version 3.0, which has so far been relegated to the inside of Smart TVs by the likes of LG. That grants the Qube a few extra nice features, including voice-activated search through a microphone nestled in its multifaceted remote. When the Asus representative helping TechRadar out attempted to use voice chat to search for "Conan," we landed at "College" instead, with university-themed movies and TV shows popping up on the screen. The rep said her raspy voice, raw from several days of CES, was to blame. Indeed, when we tried "It's Always Sunny in Philadelphia," the most complicated show name we could think of, it took us straight to the right place. The Qube's search function is smart. If you query the title of a movie or show, it gives you options for watching that program; saying "ESPN," though, as the Asus representative demonstrated, prompted the box to give us the choice of showing live programming, searching the web and more. You can also search by genre, actor and more parameters, according to the Asus rep. The double-sided Asus Qube remote has a full QWERTY keyboard on one side and a number of buttons, including those for live TV, Netflix, picture-in-picture and more, on the other. Also on that side is a multipurpose trackpad that, with the press of a button, can change from a full-movement mouse to a four-way directional clicker that flips the Google TV Qube's uniquely boxy on-screen UI. The gyroscope in the remote even allows for Android gaming. Asus has no idea how many developers will bother to make their games compatible with the Qube, but the remote's motion controls worked well when controlling Raging Thunder 2, the racing game they showed off at CES. The game had not been altered for use on the Qube, so its brake and boost functions were missing, but it proved that gaming on the Qube is indeed possible. It will simply be up to developers to step up and provide the correct functionality in their games. The Qube can also interface with android tablets and phones as second screen devices, a function that could potentially have applications for game developers, Asus's representative hinted to TechRadar. Let's get back on track, though - the Google TV Qube is primarily for discovering content to watch online and on TV, and at that it clearly excels. The UI will take some getting used to. It features an on-screen rectangular cube that flips up or down when you switch between its nine categories (TV and movies, gaming, social, sports, music, news, education, photos, and favorites). At launch, Asus's Qube will support Amazon Instant, Netflix, Google Play, and HBO Go, but not Hulu Plus (for now, at least - Asus's representative hinted that a deal could happen). 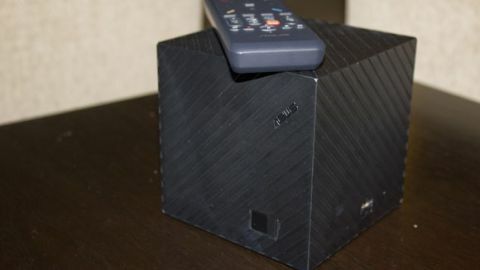 Asus's Google TV Qube is scheduled to launch in late Q1 or early Q2 in the U.S. "at first," said Asus's helpful rep, with other markets to follow at some point. It's easily the most fully-featured Smart TV device we've ever used, and with the full combined might of Google and Asus behind it, it could be the one to watch out for.